The north west region is defined by its attractive and liveable environment. It is a resource-rich region, offering advantages for residents, business owners, workers and investors. Most of the population is concentrated on the northern coastline between Wynyard and Port Sorrell with major urban centres at Burnie, traditionally recognised as a manufacturing centre, and Devonport operating as a service centre. Northern Tasmania has developed as a business hub and the centre for a growing regional population based on its economic and natural competitive advantages. The region’s focal point is the city of Launceston at the head of the Tamar River. Some of Tasmania’s top agribusinesses including vineyards, beef, honey, and cheese producers are based in the north of Tasmania. The northern region of Tasmania also has aviation and port services. Southern Tasmania is a diverse region, home to the state’s capital Hobart and also has an abundance of natural resources. The southern region is crucial to the Tasmanian economy as it is the largest region in terms of employment activity, number of businesses, government services, retail, professional services, education, arts and cultural activity, major events, recreation and tourism attractions, and aviation and port services. Port Arthur and the Tasman National Park. 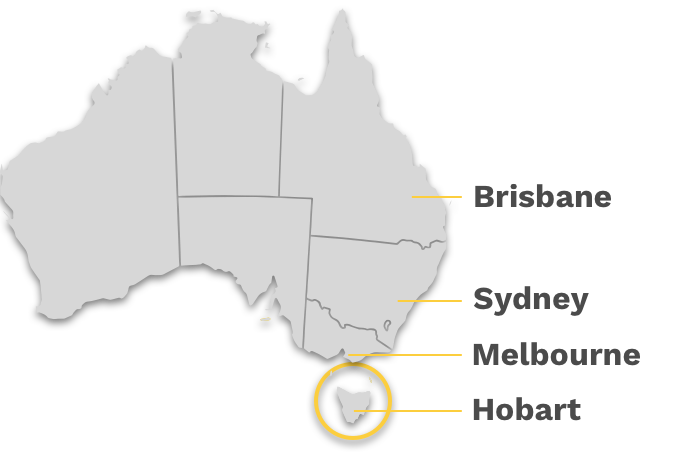 Hobart International Airport (HBA) is located in Cambridge, which is a short 15 minute drive from Hobart city. It is the major passenger airport in Tasmania. The major airlines servicing the airport are Qantas, Jetstar Airways, Virgin Australia and Tiger Airways Australia operating domestic flights predominantly to Melbourne airport and Sydney airport. For more information please visit the Hobart International Airport website. Launceston Airport (LST) is a regional airport located 15 kilometres from the Launceston city centre. It is Tasmania’s fastest growing airport and the second business in the state. The total number of passenger movements through Launceston Airport is projected to increase annually by 2.7 percent. For more information please visit the Launceston Airport website. TT Line operates a ferry service on the route between Devonport and Melbourne. The two ferries operated by TT Line conduct approximately 800 sailings per year. They can each carry up to 1 400 passengers and can accommodate up to 500 vehicles. For more information please visit the Spirit of Tasmania website. Tasmania’s capital city Hobart is located around a picturesque harbour. Tasmania has a population of more than half a million and about 40 per cent live in the greater Hobart area. It is the second oldest capital in Australia after Sydney and is a city with outstanding natural, cultural and social qualities that make it unique among capital cities. The city is also home to the southern University of Tasmania campus including the Institute of Marine and Antarctic Studies (IMAS). Launceston has been voted one of Australia’s most family-friendly places because of its affordable housing, good access to schools and a safe community. It features key regional infrastructure facilities, including a modern regional airport, the northern campus of the University of Tasmania and adjacent Australian Maritime College, and the Launceston General Hospital. The Launceston Airport is a close drive from the city and provides access to major cities including Melbourne and Sydney. Burnie is a port city on the north-west coast of Tasmania. It hosts Tasmania’s third largest hospital, the North West Regional Hospital, Burnie Airport, home to the Cradle Coast campus of the University of Tasmania, and campuses of the Tasmanian Polytechnic and Tasmanian academy. Burnie Port is also Tasmania’s largest general cargo port. Devonport is situated at the mouth of the Mersey River. Along with the slightly smaller city of Burnie, Devonport is the major regional centre of the north-western part of the state. It is the southern terminus for the Spirit of Tasmania ferries, which connects Tasmania to Melbourne and the port is one of the major freight hubs in and out of Tasmania. All Tasmanian ports are managed by Tasports. The state’s major ports are located in Hobart in the south, Bell Bay in the North and Devonport and Burnie in the north west. For more information please visit the Tasports website.